Free service. Just follow the simple instructions below. Please read all of the instructions below first to ensure your subscription is successful. Please enter your email address into the box below, and click the “Subscribe” button. Once you click the “Subscribe” button, you will see another window open that looks like the image below. Type the green letters into the box on that page and then click the Complete Subscription Request button. Once you’ve entered the code successfully, you will receive an email at the email address you entered in step 2 (example below). Open this email and click the link inside to activate your subscription. That’s it. You’ve been subscribed and will start receiving obituaries within the next 24 hours.Read the FAQ below for answers to common questions. People subscribe to our obituary email feed to avoid paying monthly newspaper fees, and also to read obituaries that are only published on our website (not in local papers). Do emails include ALL of the obituaries within the Greater Rochester, MN area? No. 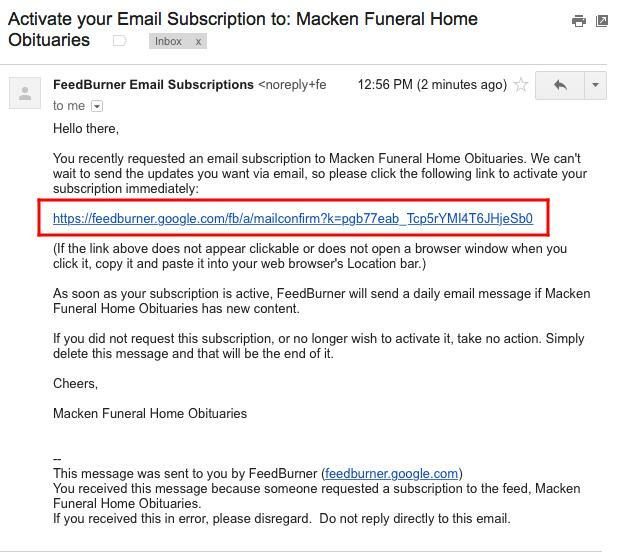 The obituaries you will receive are derived from Macken Funeral Home services only. We do not aggregate obituaries from third parties. 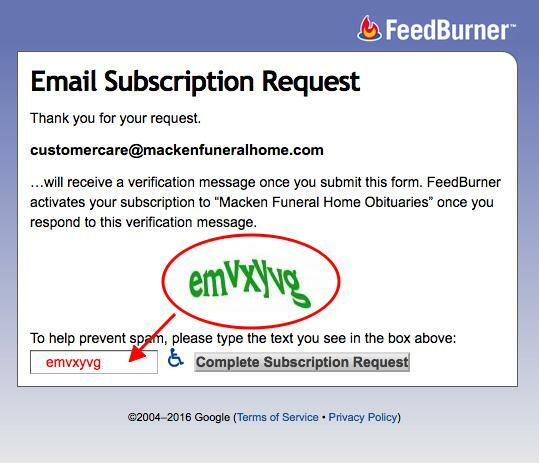 Emails are sent automatically daily between 3:00am - 5:00pm and include all new obituaries we’ve added since the last email. If we do not add any new services for a particular day, you will not receive an email the following day. Just click the Unsubscribe link from within any of the emails you receive and you will be immediately removed from the list.